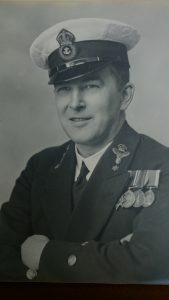 Rhys Roberts’ grandfather, Samuel Robert Vaughan Roberts, was at the Battle of Jutland as a stoker aboard HMS Blanche under the command of Reginald Drax, later Admiral. 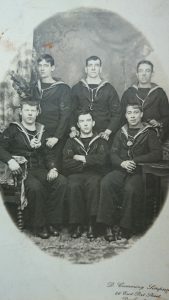 He joined the Royal Navy when he was 18 in November 1913 for a twenty-two year contract. HMS Blanche, Roberts is in the center of the first row. When he finished in 1935 he thought he had retired but was called for duty again in 1939, and finished duty with the RN in 1947. During both World Wars and the inter war years he was involved in many operations on many different ships including HMS’s Valiant and London. He worked his way up through the ranks to Chief Petty Officer and Chief Stoker. He died in 1973.